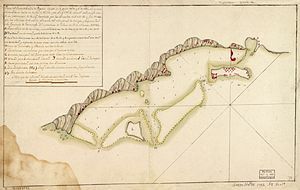 The Battle of Roatán (sometimes spelled “Rattan”) was an American War of Independence battle fought on March 16, 1782, between British and Spanish forces for control of Roatán, an island off the Caribbean coast of present-day Honduras. A Spanish expeditionary force under Matías de Gálvez, the Captain General of Spanish Guatemala, gained control of the British-held island after bombarding its main defences. The British garrison surrendered the next day. The Spanish evacuated the captured soldiers, 135 civilians and 300 slaves, and destroyed their settlement, which they claimed had been used as a base for piracy and privateering. The assault was part of a larger plan by Gálvez to eliminate British influence in Central America. Although he met with temporary successes, the British were able to maintain a colonial presence in the area. Gálvez, who had been ordered by King Charles to “dislocate the English from their hidden settlements on the Gulf of Honduras”, began planning offensive operations against the British mainland settlements as early as 1780, after the British abandoned their failed expedition into Nicaragua. He raised as many as 15,000 militia, and received financial and logistical support from many parts of the Spanish colonial empire in the Americas. For logistical and diplomatic reasons, no operations were launched until after the American victory at Yorktown in October 1781. The British loss opened the possibility that the British would be able to deploy troops to Central America to better defend the area. Gálvez’ plans called for assaults on the British presence in the Bay Islands (principally Roatán), followed by a sweep along the coast to eliminate the British from the mainland. Troops from central Guatemala were staged in early 1782 at Trujillo for the assault on Roatán, while additional forces moved overland from Nicaragua, Honduras, and Salvador toward the principal British settlement of Black River. Gálvez arrived at Trujillo on March 8 to organise the assault on Roatán. Leaving a force of 600 at Trujillo to further harass the British and their partisan allies, he embarked another 600 troops onto transports, and sailed for Roatán on March 12, escorted by three frigates (Santa Matilde, the Santa Cecilia, and the Antiope) and a number of smaller armed naval vessels, under the command of Commodore Enrique Macdonell. The British residents of Roatán were aware of the ongoing Spanish military activities. The main settlement, New Port Royal, was defended by Forts Dalling and Despard, which mounted 20 guns. The island’s white non-slave population was however quite small. 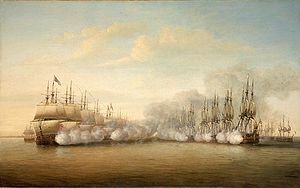 In 1781 they appealed to the British commander at Bluefields for support, but he was only able to send additional weapons, which did not add significantly to the island’s defenses. 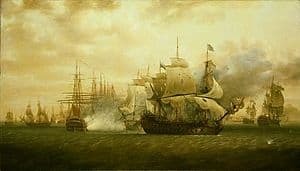 The Spanish fleet arrived off Roatán early on March 13, and, after its defenders fired several ineffectual cannon shots, anchored out of range while Gálvez sent a party in to request the surrender of the island’s defenders. The defenders asked for six hours to consider their options, which Gálvez granted. After that time had elapsed, the defenders indicated that they were prepared to stand their ground, and refused to surrender. Immediate attack was not possible due to high winds and rough seas, so Gálvez then held council, and a plan of attack was formulated. At about 10:15 am on March 16, Spanish guns opened up against Forts Dalling and Despard, which guarded the mouth of New Port Royal’s harbour. By 1:00 pm the British guns there had been silenced, and Major General Gabriel Herbias began landing troops. 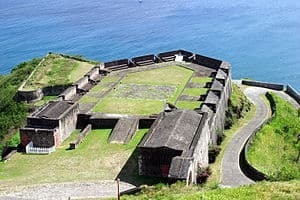 After the two forts were secured, the Spanish warships entered the harbour and began raking the town with cannon fire, while British artillery fired back from positions in the hills above the town. This exchange continued until sunset, at which point the British defenders capitulated. The Spanish had two killed and four wounded in the battle, while only two slaves were wounded on the other side. Terms of surrender were agreed the next day. Gálvez and his men remained on the island for several days, collecting weapons, rounding up slaves that had run away, destroying all the buildings and agriculture on the island, as well as burning many of the ships in the harbour, which they assumed to be used in smuggling and other illicit trade. The Spanish left the island on March 23, carrying as prisoners of war 81 British soldiers, 300 slaves, and 135 British civilians. The prisoners were sent to Havana, where the slaves were auctioned off and the others held until they could be exchanged. Gálvez was able to only temporarily partially eliminate British influences in the area. He followed up his success at Roatán with the capture of Black River in early April, but any attempt to advance further bogged down. James Lawrie, the commander at Black River, and Edward Marcus Despard successfully recaptured Black River, and were able to hold it until the end of the war.